Working portable a lot I was looking for a set up that could help me work the DX that I could mostly copy on my vertical end fed wire antennas but that I had a hard time working - especially in a pile-up situation. 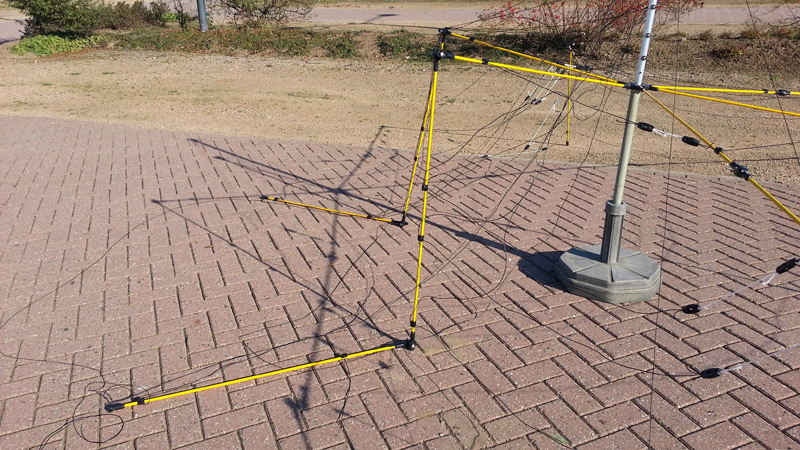 I bought the CB yagi first and changed that into a 4 element 10m yagi. Later I bought the folding hexbeam. 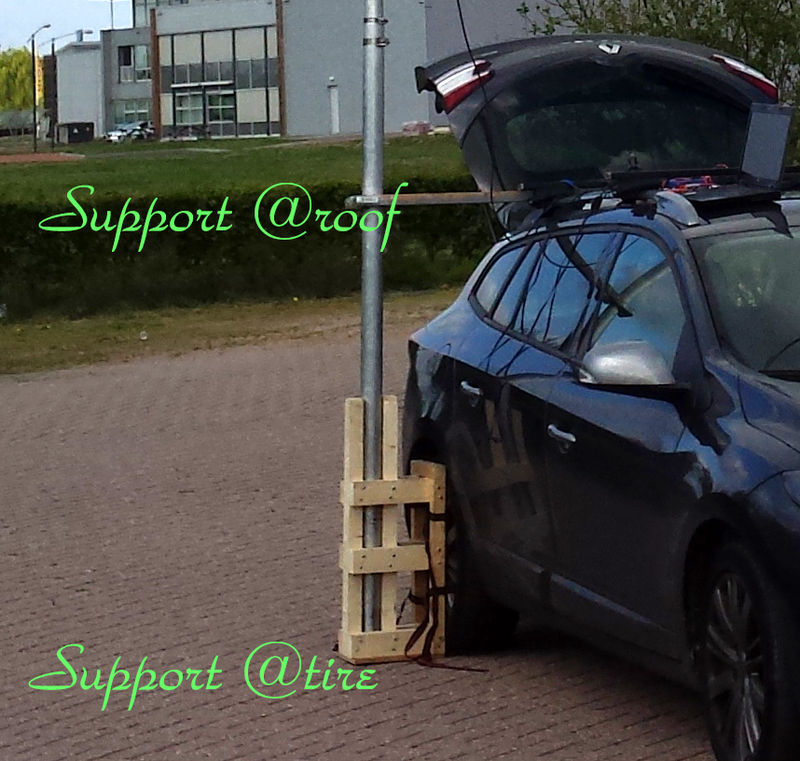 Both are very nice antennas to work DX. 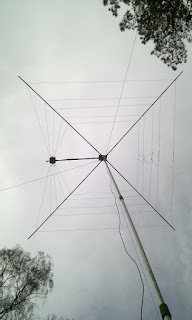 Of course I could not put these antennas up with the fiberglass poles I use for the end fed wires. So I set out to find a portable mast that was sturdy enough to set up without guying (under low wind conditions) and could reach at least 10m high. This turned out to be a challenge. There is not much out there that is strong enough to set up without extensive guying or it is outrageously expensive. After a while I decided to build a mast myself from aluminium tubes. I could not find the right material around where I live. 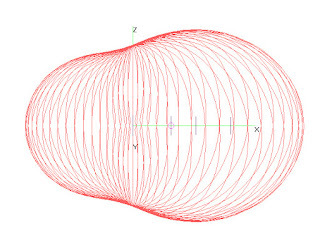 The challenge is that you need a nice series of diameters with 1-2mm in between the sections. The other challenge is that you do not want to buy 6 meters of each section (which is the default "industry length"). 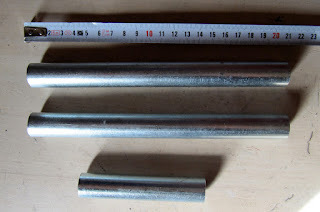 Luckily it turned out there is a webshop for aluminium stuff in The Netherlands that stocks almost all diameters and sells custom lengths. 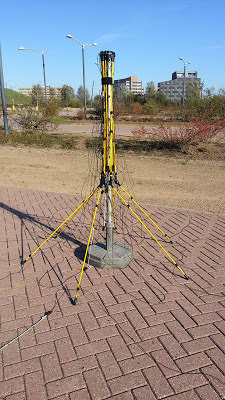 What would be the dimensions to choose if you want a sturdy but still portable mast? The widest tube is 2 meters long - running up to 2,4 meters length for the last tube. I did this to make sure they collapse together nicely with each narrower tube sticking out the previous one. 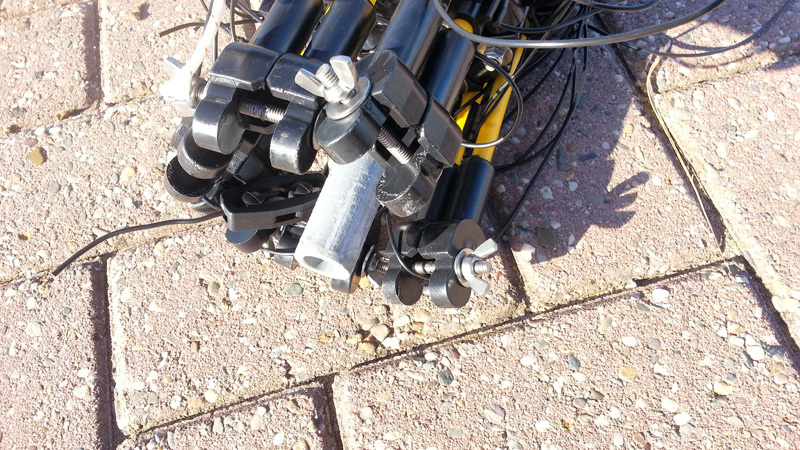 Now how do you clamp the tubes together when you want to extend the mast? 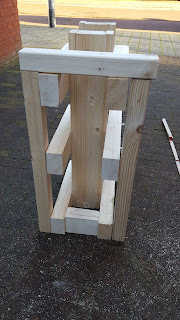 For this I used my angle grinder to grind slits into the top of each section. In the most narrow tube I used 4 slits (the gap between the 42 and 35 is larger), for the other sections I used 2 slits. 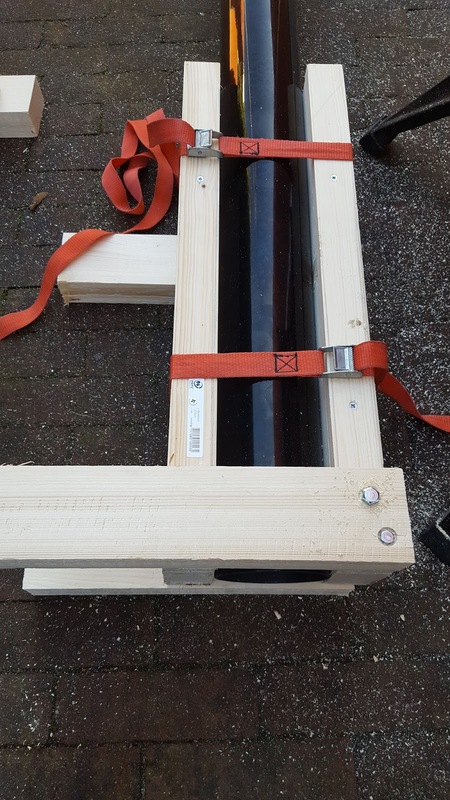 Note: be sure to carefully file the metal afterwards or you will find that the tubes "stick" when you want to extend the mast. Over this upper part of each section I slid a heavy duty tube clamp. I started using a version I found in a boat shop but they are made of stainless steel. As this is slightly softer the threads of the bolt used to open and tighten the clamp tend to damage quickly. 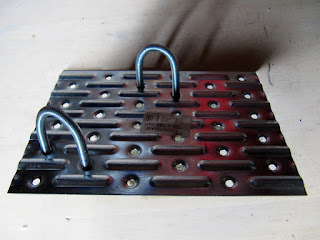 Now I am using a different kind that seem to be more durable (see the picture above). 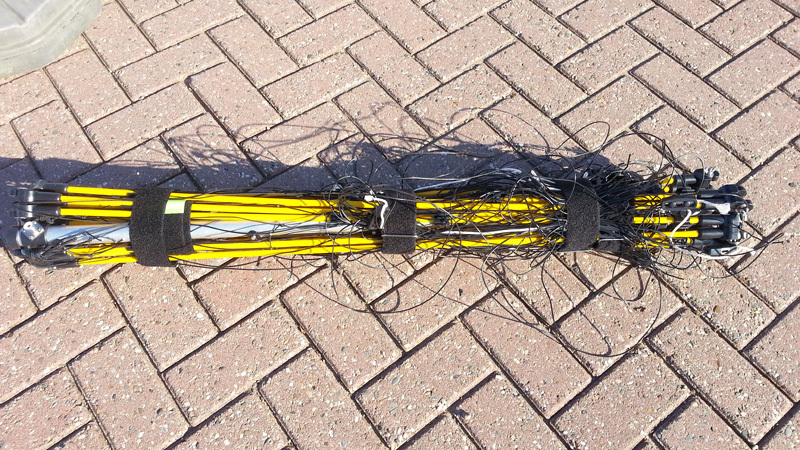 Extending the tubes can be hard work, especially under windy conditions. In those conditions the mast tends to bend putting a force sideways on the tube you want to extend. This increases the friction. 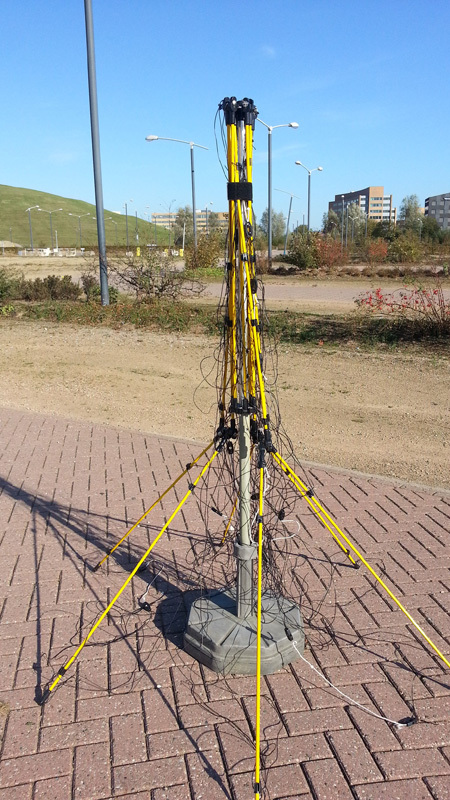 In conditions of low winds the mast can be extended completely without guying. It needs to be on a level surface though. 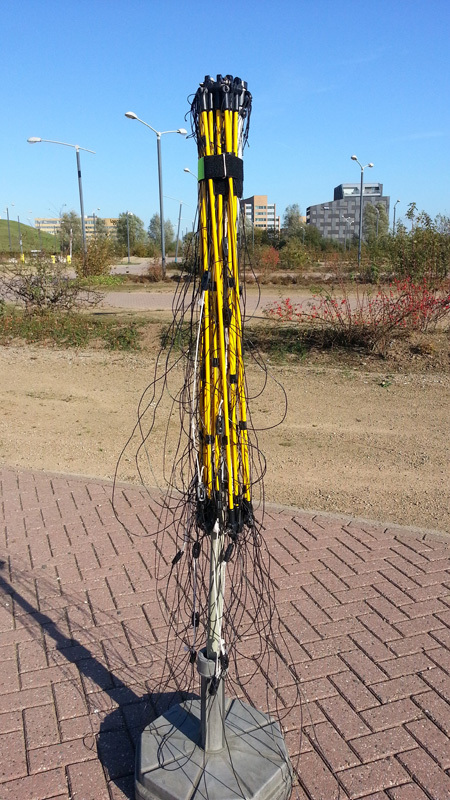 When the wind is somewhat stronger I do not extend the last section and still use the mast without guying. At some point it will need guying, either to compensate for not setting the mast perfectly upright or for windy conditions. For this I added a simple and low cost guy ring out of PVC (as can be seen in the picture). 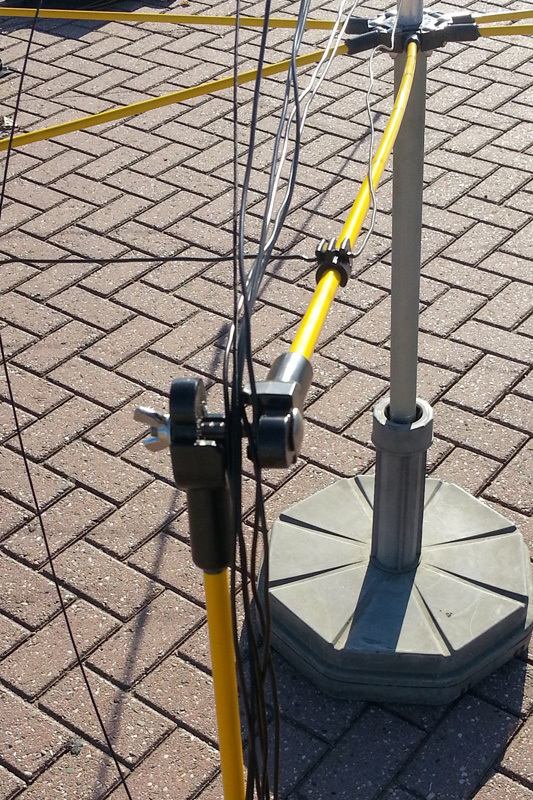 It does what it needs to do: act as an attachment point for the guy wires and stay in place while the mast rotates. 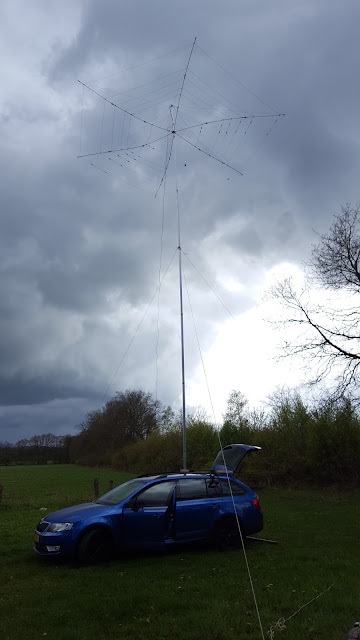 I have been using this mast now for more than a year and I am happy with it. When I set it up, I secure it at the base (I built a mast foot from wood that attaches to the wheel of my car) and at the roof of the car (again using a wood construction) I am still considering changing the base I use. I will write about that one another time. As blogged before I got myself the 6 band portable hexbeam by DL1ELU. His manual is very detailed so there is no way that I can add anything useful to that. There are however some tricks to learn about the folding and unfolding of the antenna once you have built it from the kit. 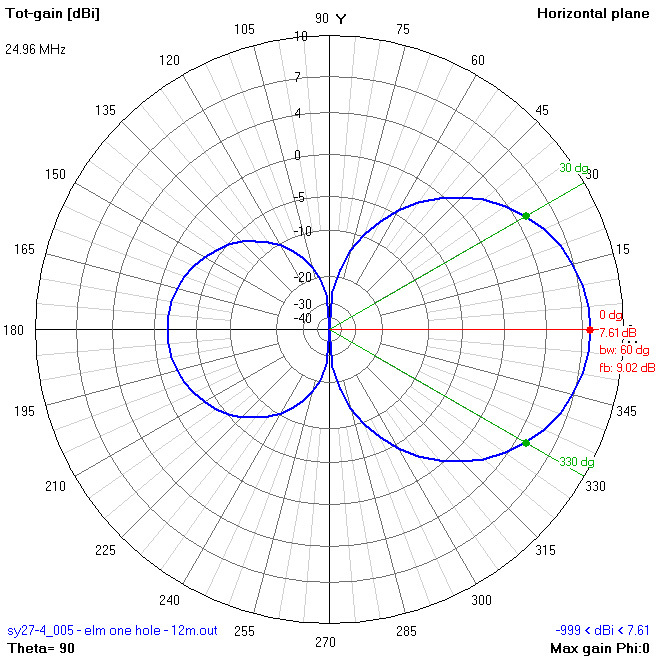 What I want to do here is add my experiences with the setting up of the antenna hoping it will help others who like myself did not really get it right first time. If you have tips that speed up this process, please let me know. 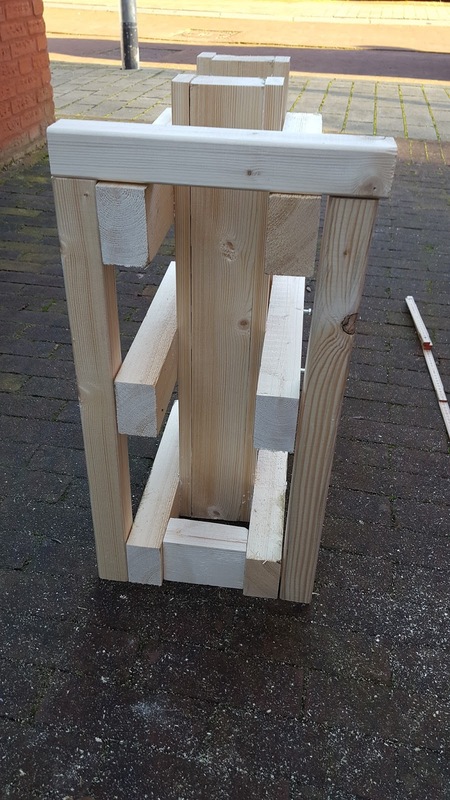 Assuming you have put the hexbeam together for the first time, your first challenge is to fold it for storage. So let's start with the folding process. One important tip: do use a stand of some sort so you can keep the beam upright when folding. I tried it without and ended up with a big wire mess. If you're lucky and your mast goes low enough than leave it on there (mine doesn't - it doesn't go lower than 2m, which means I can't reach the top of the beam). I bring a parasol stand just for the (un)folding. UPDATE: after a tip of another OM I now use a view pieces of PVC pipe connected to a 5 way fitting (four legs on the ground and one up). 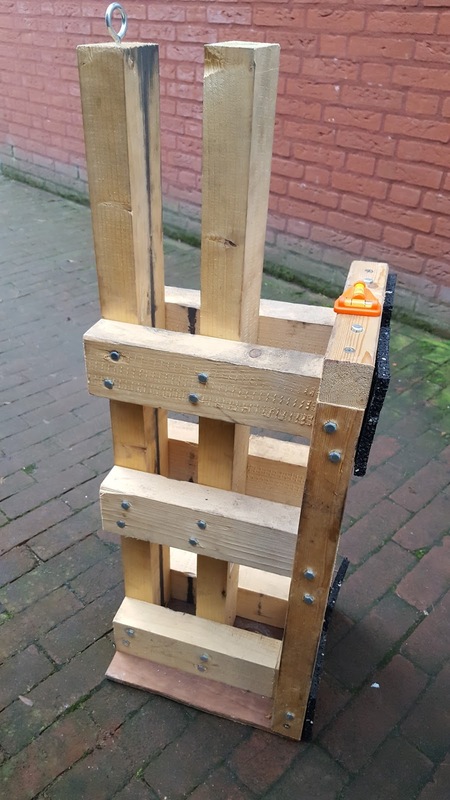 This works well, is light and easily transportable. In fact they pipes fit neatly in the Hexbeam bag. The parasol stand does a very important job at this point: it keeps wires from ending up on the wrong side of the antenna. If that happens you are in for a nice untangling job later. Okay, now you can put the antenna in the handy bag Christian provides and leave it there till the next activity. 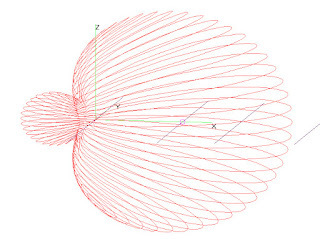 So how about unfolding the antenna? I use the parasol stand as described above. It keeps the wires nicely on the right side of the antenna. When unfolding I unstrap the first two Velcro straps and loosen the wires a bit, making sure they hang freely. The last step is closing the joints between the inner and middle spreader and moving the completed Hexbeam on to my push up mast. As the antenna weighs next to nothing this is not a very difficult move. It is like walking around with a rather large umbrella. This process took 15 minutes including taking the pictures. If I solve the folding issue described below I think it can be done faster. I still need to address one issue. I have not fixed the position of the wire clamps. With the folding and unfolding they tend to move a bit. This distorts the delicate balance I created when I first put on all the wires. 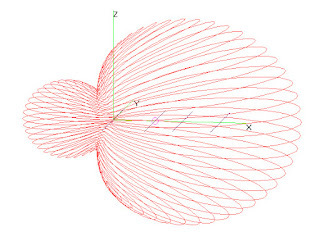 So now all spreaders bend in different shapes (see the picture below). 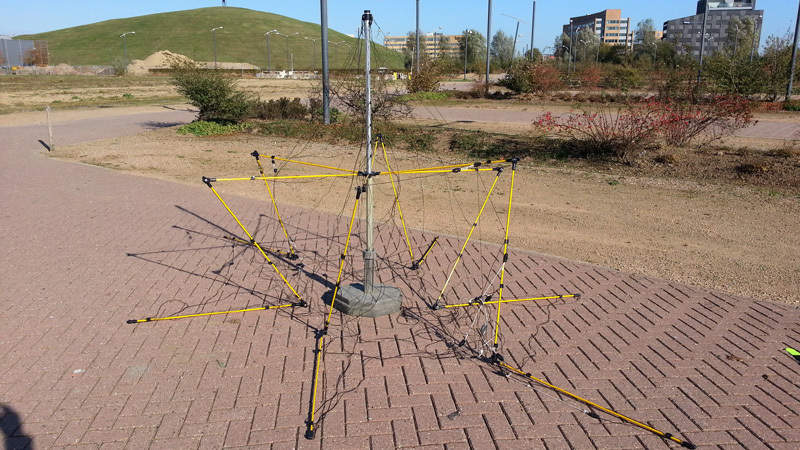 It is difficult to rebalance the whole antenna and straighten all the spreaders. 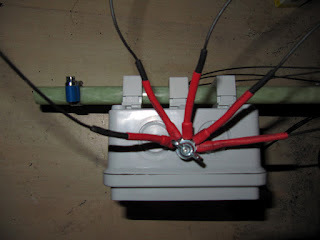 So in the near future I will remove all the wires and put them on again one by one making sure I fix the wire clamps when I am done (Christian remarked btw that it is wise to fix the wire clamps when you use the antenna for portable operations regularly). 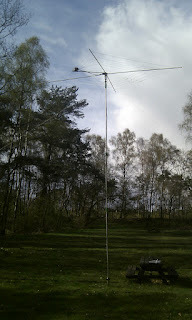 As blogged before I got myself a cheap 11 meter 4 element yagi (Sirio SY27-4). 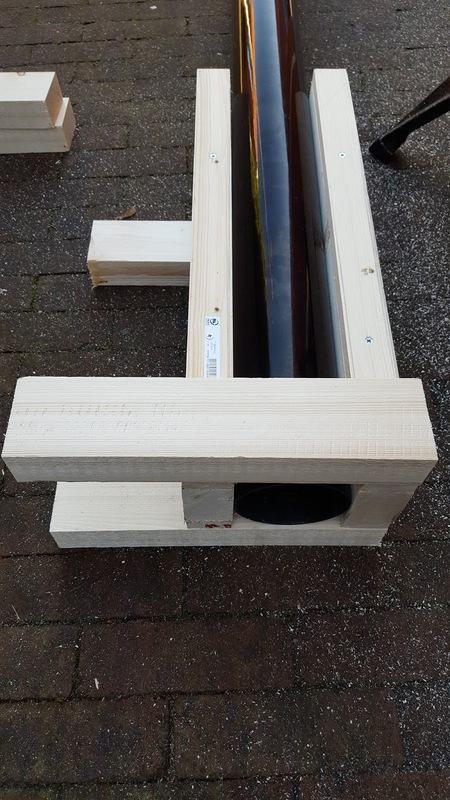 I am now in the process of making a manageable yet strong and high enough mast to use in a portable set-up as well as optimising the antenna itself. Today I started using a modelling program called 4nec2. It took me some time to figure out how to use it but in the meantime I have modelled a few different configurations of the Sirio. 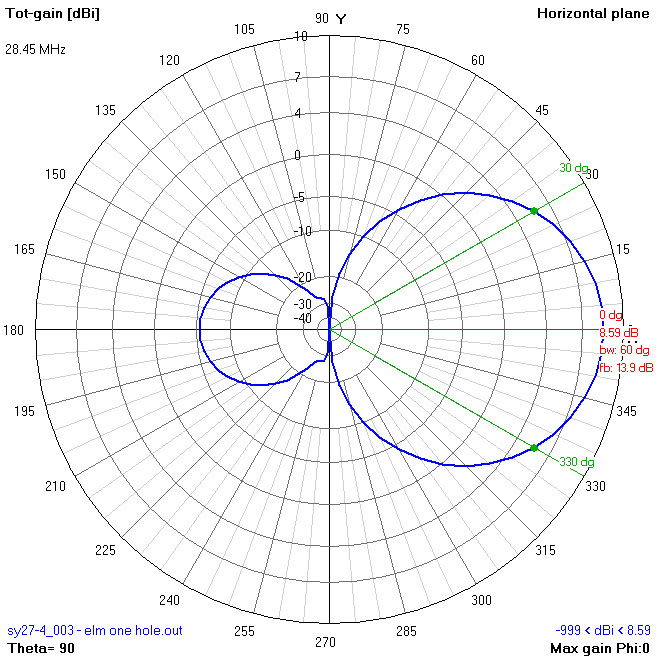 The main figures for this original configuration @ 27.2Mhz: Gain: 8.39dB, F/B: 18.5dB and beamwidth: 60 degrees. 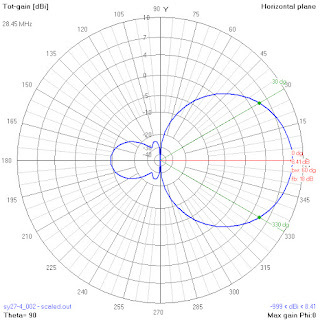 The main figures for this shortened configuration @ 28.45Mhz: Gain: 8.59dB, F/B: 13.9dB and beam-width: 60 degrees. The main figures for this scaled down configuration @ 28.45Mhz: Gain: 8.41dB, F/B: 18dB and beam-width: 60 degrees. The F/B ratio is back up to 18dB. Gain is roughly the same. To me this does not seem like a worthwhile change as it involves adding new holes to the elements. It might be a good step when F/B ratio is relevant. While researching antenna models I also came across a model designed by DF9CY. Christophe apparently also changed an 11m beam into a 10m one. 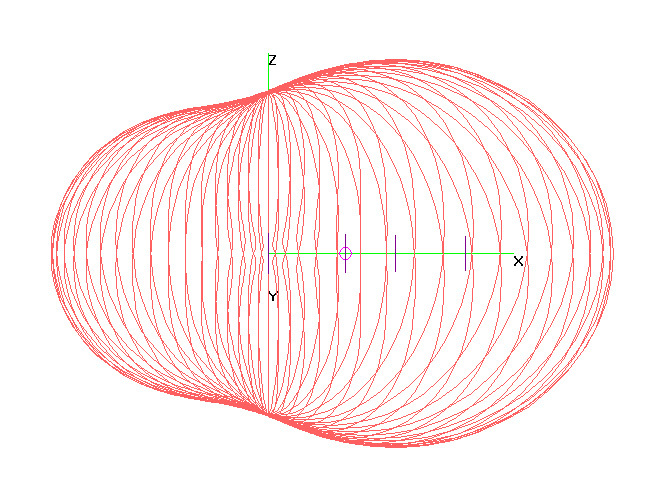 The radiation pattern of his antenna also looks very good. 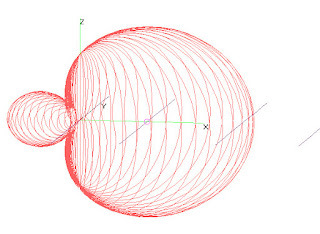 The position of the elements along the boom is a bit different: the dipole is much closer to the reflector. 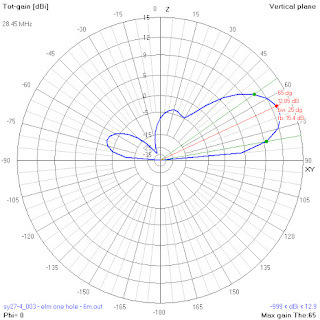 Christophe's version performance @ 28.45Mhz: Gain: 8.64dB, F/B: 16.3dB and beam width 60 degrees. The performance looks a lot like the scaled down version of the Sirio. Christophe achieved a bit more gain while opting for a bit lower F/B ratio. 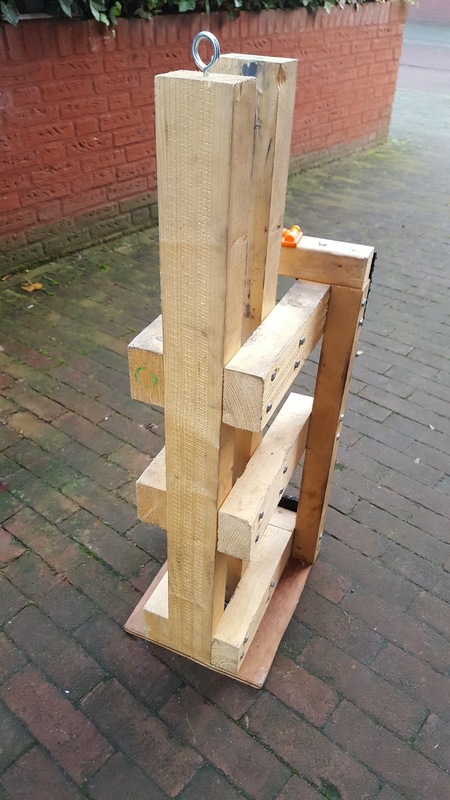 All in all this tells me that taking the Sirio and changing it by just moving all sections in by one screw hole leads to a very acceptable 10m beam that is hard to beat by any other configuration (if you take the 4m length of the boom as a given). 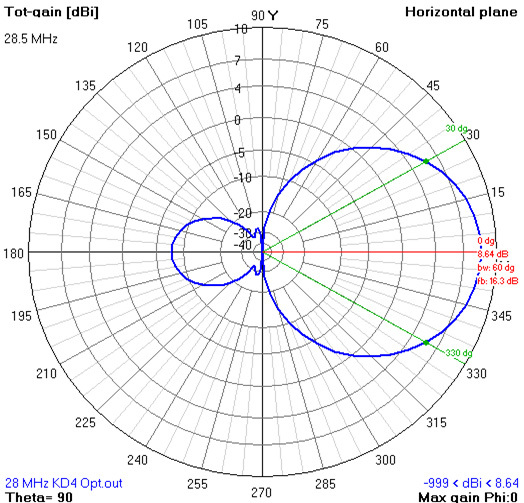 The sigma match for this configuration needs to be 22cm extended for the SWR to be flat around 28.4Mhz. Another advantage of taking the "one screw hole"-approach is that you can use it the other way around and create a rather decent 12m antenna. 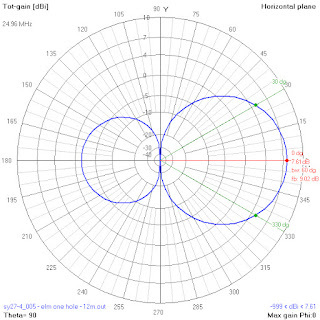 If you keep the boom positions as they are and move all sections of all elements out by one screw hole (from the original two screw connection) you get a 12m antenna that works as shown below. The performance @ 24.65Mhz: Gain: 7.61dB, F/B: 9.02dB and beam width 60 degrees. This is not brilliant - especially the F/B ratio is low - but compared to my vertical wire this should deliver a better performance. The question is whether I will be able to tune this antenna using the standard gamma match. Will have to find that out later. 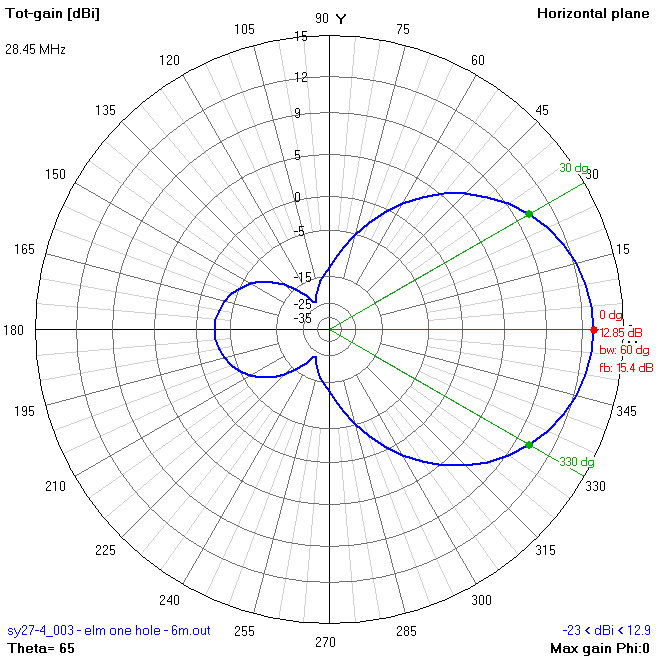 At 15 degrees elevation (more relevant for DX) the gain is still 12dB. This should help me to get in touch with some DX. Update November 2012: In the meantime I built the portable alu mast to hold this antenna. The mast goes up to approx. 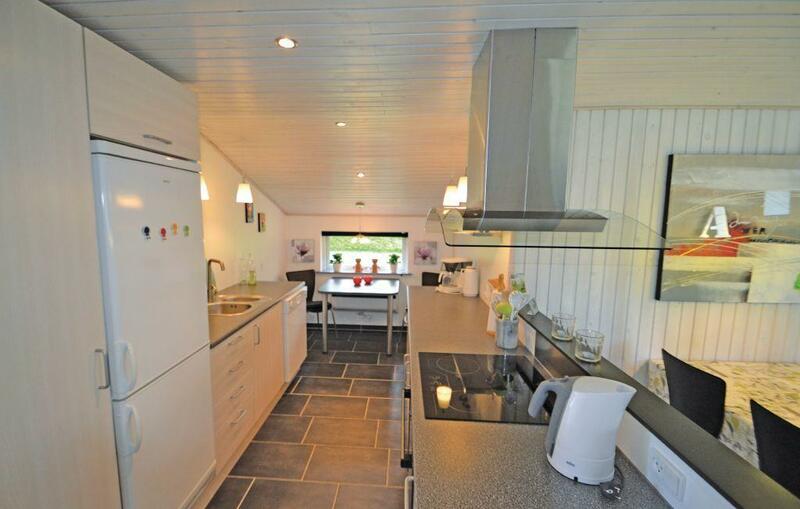 13m (43ft) without the need for guying (even with the beam). 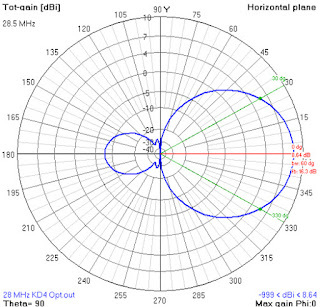 I used this combination during CQWW SSB 2012. The beam was at that time around 11m (37ft) high. It then has a theoretical gain of 13.6dB at 15 degrees. 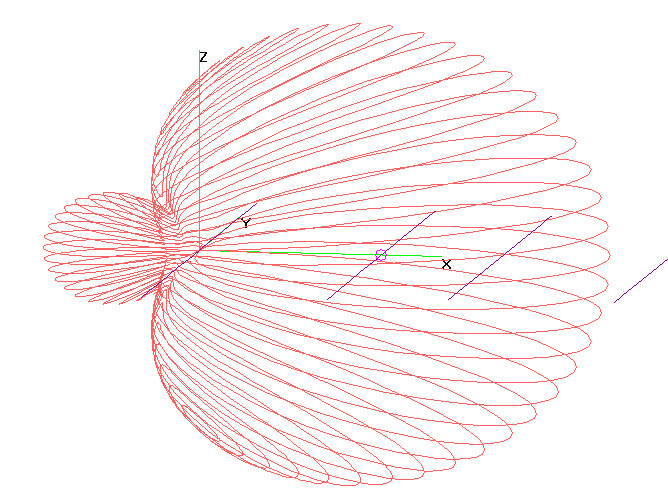 Perfect for DX-ing on paper but also in practise. Check out my experiences here. Living in a densely populated area antennas are an issue here. Officially I can place one antenna provided it is situated at the back of my house and not higher than 5 meters above the point where the antenna or mast meets the roof line. 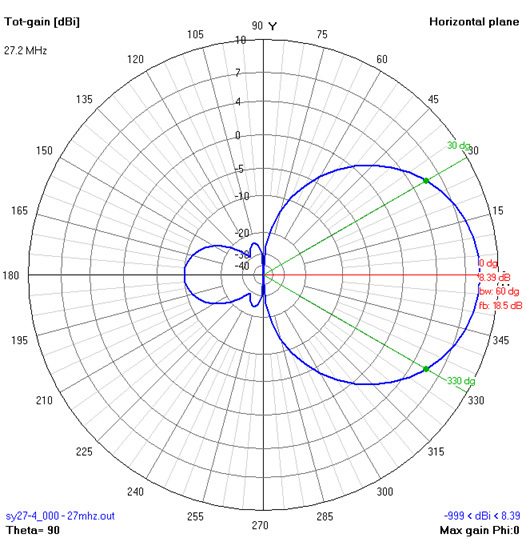 The challenge: how to get good results on multiple HF bands from the home QTH with an antenna that is not too much in your face. 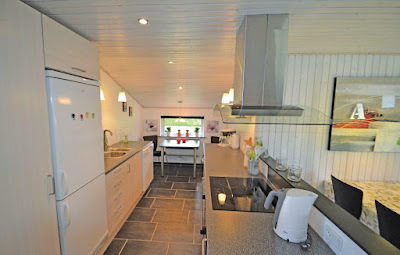 Following the official rules I could still install an enormous beam (provided the width fits my 9m wide lot). However this would create problems with the XYL, neighbours and probably the official body that has a say on the aesthetics of any change you make at or around your house. 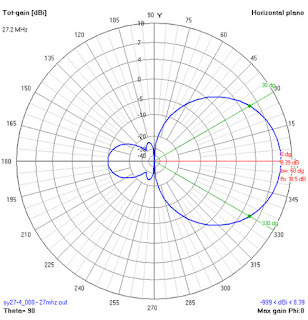 In 2010 I worked mainly using a Ventenna dipole in my attic (inside the house) - not a real DX killer. In 2011 I started using an end fed half wave wire that I set up sloping from my attic window into the garden. 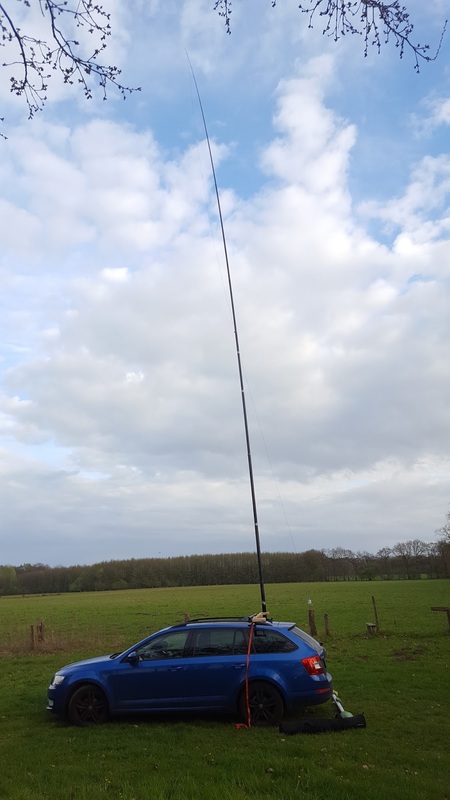 This worked a bit better but I need to change the wires for different bands and I keep on getting better results when I work portable with the same end fed wire vertically on a fibreglass mast. 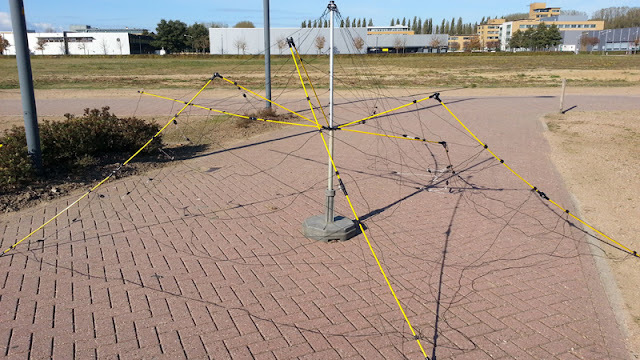 Reading a lot of enthusiastic stories on the Cobwebb antenna (originally by Stephen Webb, hence the weBB) and considering its dimensions I thought it would make a good compromise for my situation. 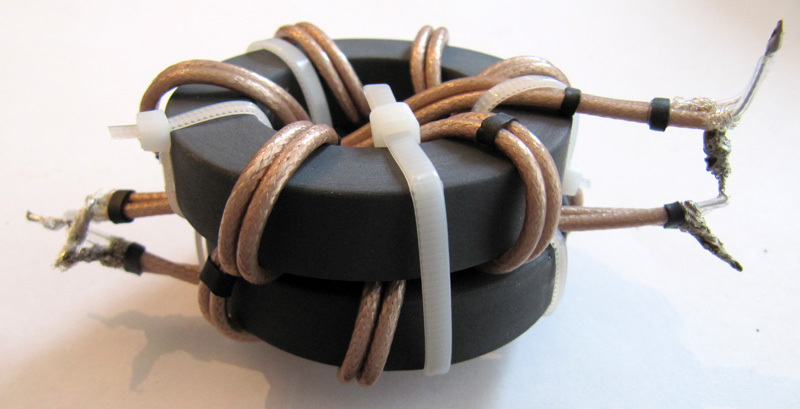 There are two main configurations for the Cobwebb: the original T-match version as developed by G3TPW and the 1:4 balun version as developed by G3TXQ. Comparing the two versions it appeared to me that the G3TXQ version was easier to build and tune with no apparent disadvantages. 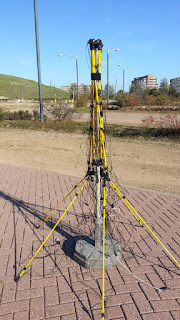 After soaking in all the information I set out to get components that would make the antenna less visible, sturdy enough to keep the antenna in one piece in windy conditions and that would allow me to use the antenna as a portable antenna if I would choose to do so. 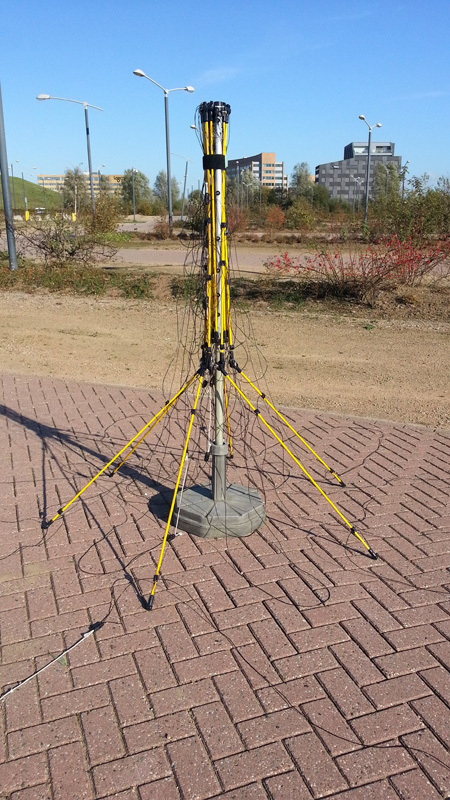 Support poles - looking at the various fishing poles used by people building this antenna I was not too enthusiastic. The fibreglass tubes used in fishing poles are rather thin. This means you have to either choose a large diameter or accept drooping poles. 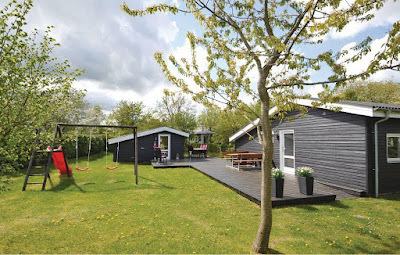 It turned out however there is a fibreglass producer in the Netherlands that sells tubes through a webshop. I visited them to find the best diameter versus stiffness. It turned out to be a 16mm diameter tube with 2mm thick walls. I bought 4 x 2m + 1x 1m of the stuff. 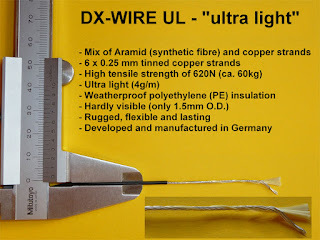 Wire - I chose to get me very thin yet very strong wire from DX-Wire in Germany. 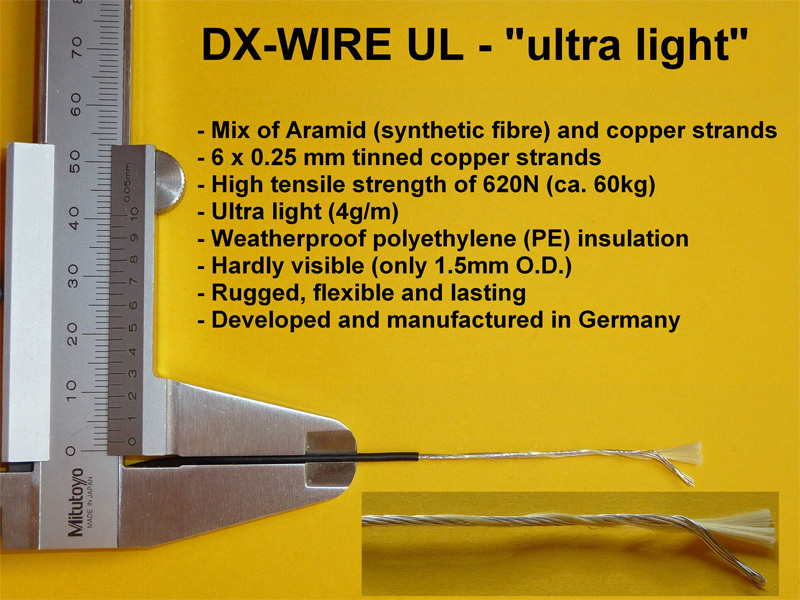 Aiming at low visibilty yet flexible wire (for portable use) I selected the UL version of their wire that has an outer diameter of 1,5mm. I was already familiar with DX-Wire through my various end fed wire antennas. Center plate - after looking for some sort of plate - preferably aluminium - I came across the plate shown in the picture. 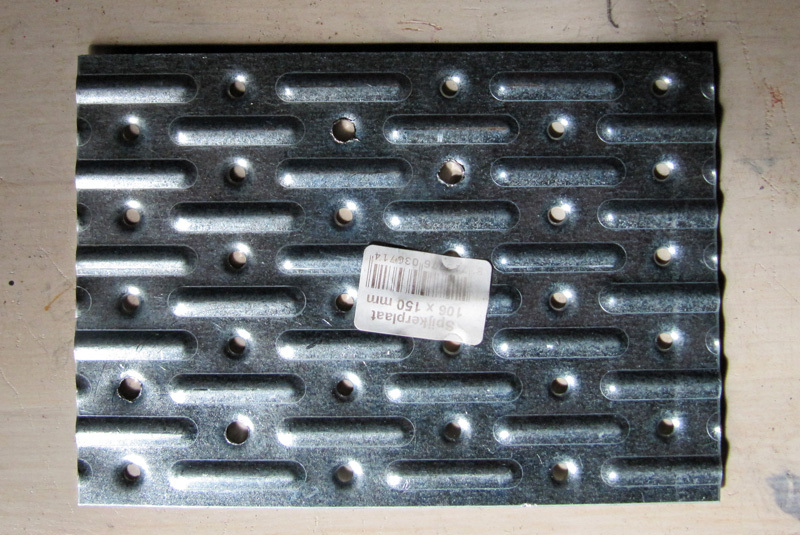 It is a very thin metal plate called a "nailing sheet" over here. 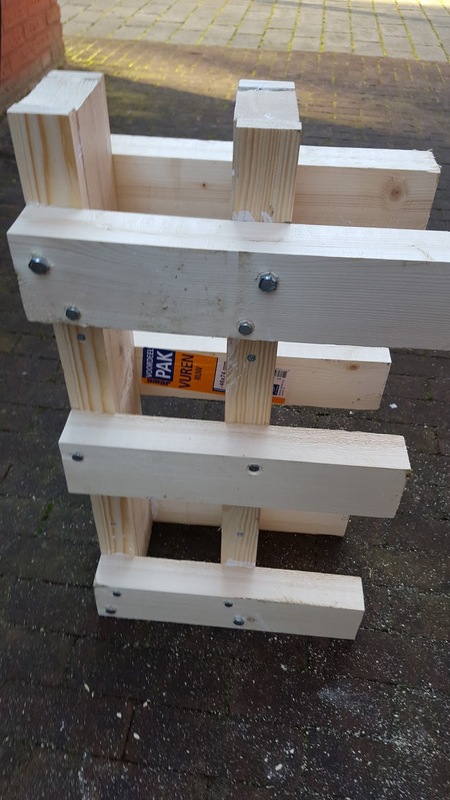 The way I was planning to connect the support poles the thickness of the plate is not very relevant. The advantage of this plate is that it holds a lot of holes that can be used to affix parts and that it is very light (good property for a portable antenna). Fixture for the support poles - I found a 50cm (20") metal axis with an inner diameter of 16mm. This suited me nicely as the fibreglass poles were just under 16mm outer diameter. The idea was to fix the metal tubes on the center plate and insert the fibreglass poles into the metal tubes. 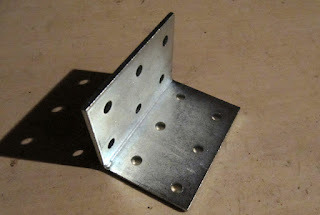 Steel angle - to be able to attach the center plate to a mast I included this piece of metal. My idea is to use the vertical strip for holding a u-bolt. For a more sturdy (permanent) setup I can extend the strip adding a plate the same width (that allows for more u-bolts) or adding a strip that is wider (that allows larger u-bolts). Junction box - the antenna needs a 1:4 (12.5 : 50) balun. 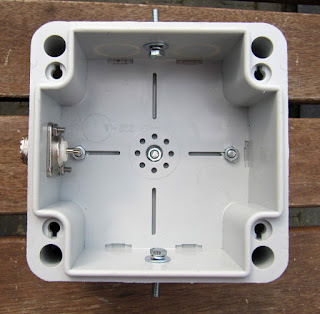 The picture shows the box already prepared for the balun. 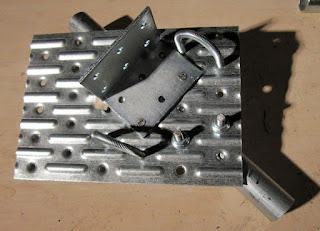 You will find more info on how to construct it below - after the center plate construction info. I chose a junction box of 110mm x 110m x 60mm (4.3" x 4.3" x 2.4"). 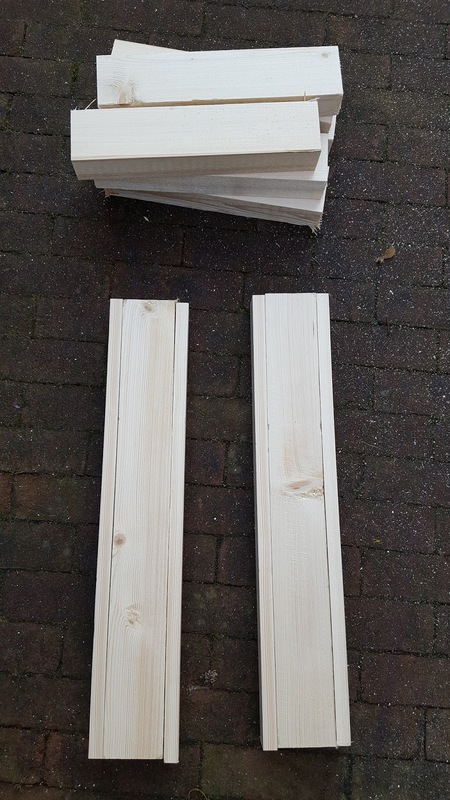 If you are looking at different sizes of boxes: the minimum I would recommend is 110mm x 100mm x 50mm. 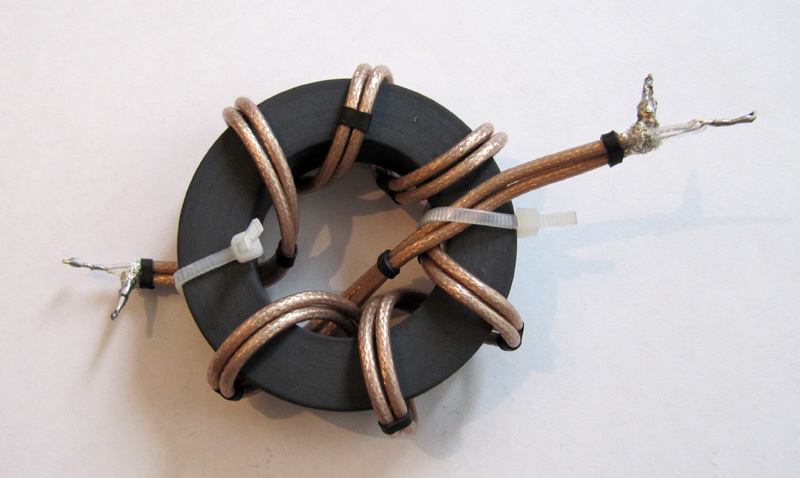 Note that I am constructing a QRO balun and therefore use large toroids. Balun parts - for the QRO balun you additionally need: an SO-239 chassis connector, two toroids (FT-240) and 2.5m (8') of RG-316 coax. ..and a hand full of washers, nuts, bolts and tie wraps. I cut the metal axis in three pieces: 2 x 20cm (to hold 2 support poles each) and 1 x 10cm (to hold the support pole for the balun). I started adding my home made u-bolts through the right holes in the nailing sheet. I had to enlarge the holes slightly (from 4 to 5 mm). 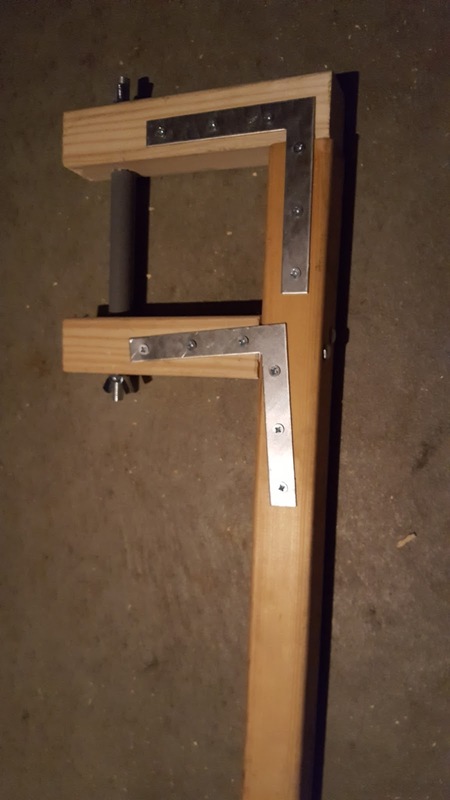 I added the metal angle that would go under one of the metal tubes, using two small bolts to keep it in the right position. I added the two larger tubes, drilled a hole through the whole stack and put a bolt through it - this is not really necessary to keep the tubes in place (the u-bolts will do that) but the center bolt marks the end of the insert for each of the four main fibreglass poles. 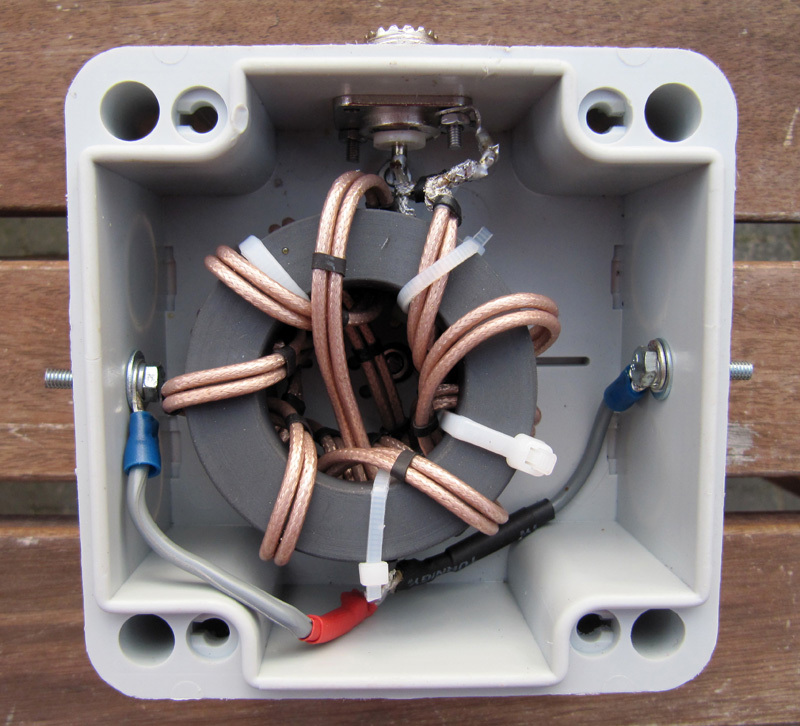 Note that G3TXQ describes a 100w balun. If you are building a QRO version like me you will need different toroids. Luckily NH7RO built one as well and shared the info. On one end connect the two combined coaxes (or 4 coax ends) braid to braid and center to center. This end will be used to connect to the antenna wires ("the antenna end"). On the other end connect the braids of one choke to the center of the other choke. 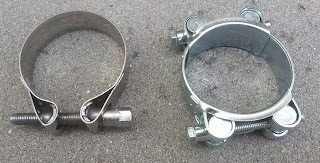 The two remaining "free" ends (center and braid) will be used to connect to the SO-239 connector ("the feedline end"). 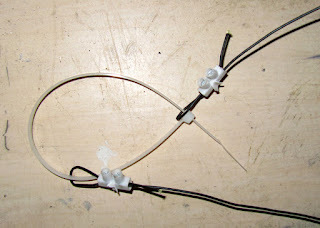 Add two short pieces of wire (of equal length) to the antenna end of the balun - so you will be able to bring these connections to the side of the balun box. 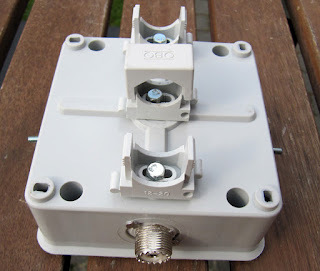 Prepare the balun box: add the SO-239 connector, two bolts to opposite sides that will hold the antenna wires and any clamp to the bottom of the box that allows you to attach the balun to the fibreglass tube later on (refer to picture 8 for a suggestion). This concludes the balun construction. 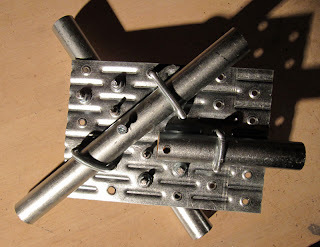 I found connecting the tinned center braids the most challenging part as they tend to break off easily. Adding the fibreglass poles is very far from rocket science once you have the center plate. So I will refrain from going into detail. 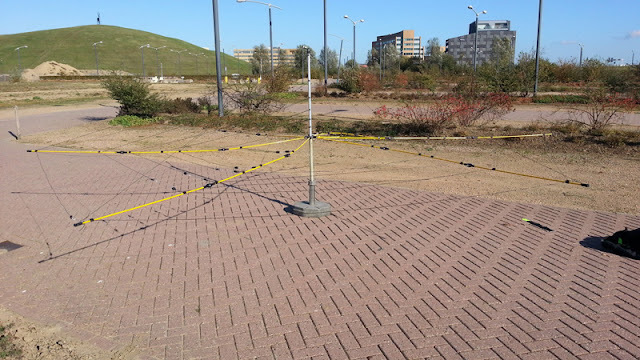 I chose to let the antenna wires keep the poles in place - so I did not affix the poles to the metal tubes.This way I should be able to take it apart relatively easily if I want to use this antenna /P. Time will tell if this is sturdy enough to withstand a storm. The frame for the antenna wires is now ready: a cross of fibreglass of 4m each side and a fifth shorter leg (1m in my case) holding the balun. Now it is time to add the wires. 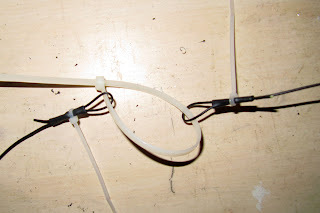 With 10 wires of the right length you can start affixing them to the fibreglass cross, one tube after one tube, one wire after the other (starting at the 10m wire and working outwards kinda makes sense). 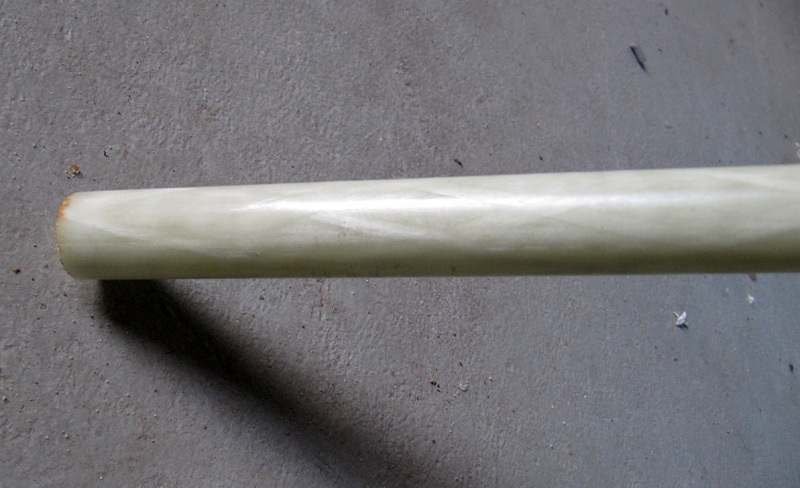 I used the centre-to-corner lengths specified above and marked them on the fibreglass tubes. That way I knew where to (approx.) wrap the tie-wrap around the wire and tube. The other end of the wires are the ends of the folded dipoles. They need to stay some space apart. 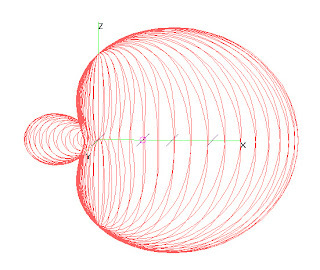 The length of the wires and (therefore) the amount of space in between will change during the tuning process. 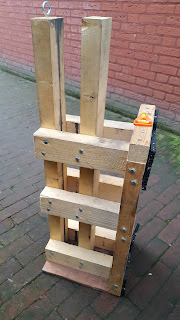 To keep the ends at an adjustable distance I tried several things but finally went for electrical strip connectors (single pieces) and tie wraps. For every end of wire I folded over a piece of the wire, slid the connector over it and screwed it tight. That way I created small wire loops on all wire ends that could be connected using long tie wraps. By folding over too much wire at the beginning of the tuning process I knew the wire ends would only get closer to each other during the tuning. That is what you want if a tie wrap is keeping the ends together (as a tie wrap is easily tightened but not so easily loosened). Whatever you select as the material to keep the wire ends apart be careful that the material does not soak up water and influence the SWR of the antenna. 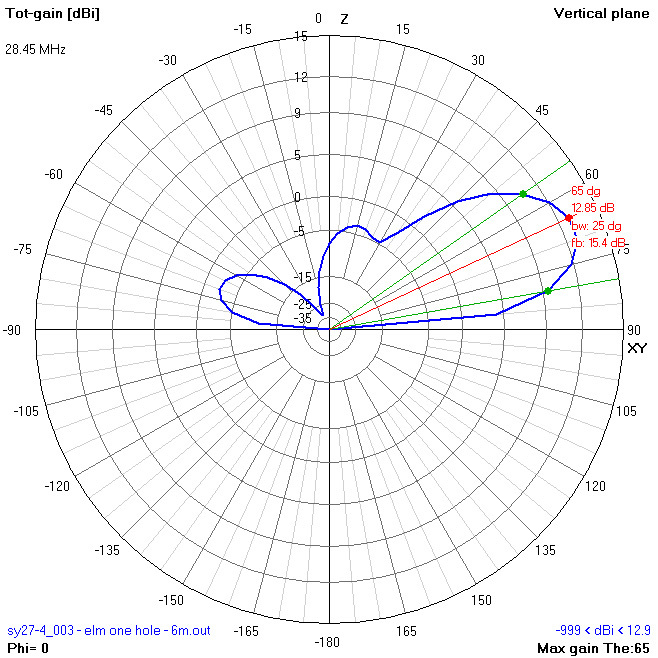 I tuned the antenna today (April 22, 2012) using only the built in SWR meter of my FT-857d (very doable). 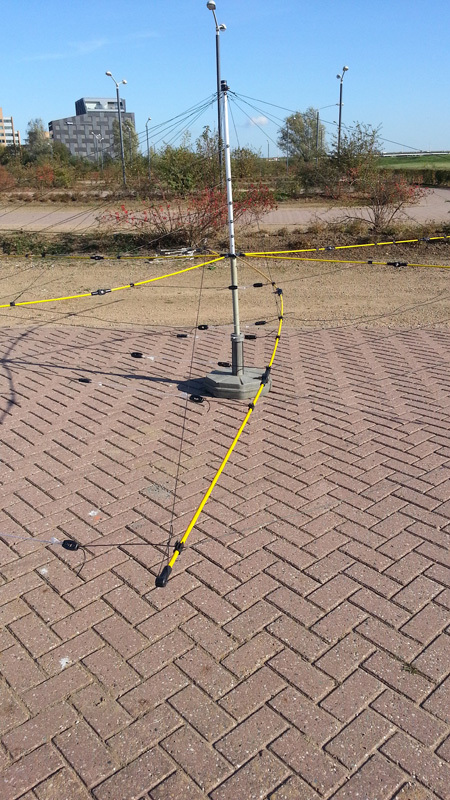 I started with the 10m band dipole. 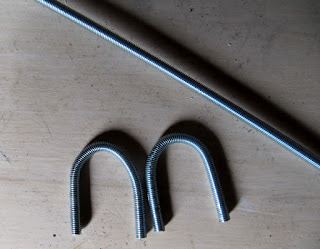 I read about different results people got when changing the effective wire lengths either by folding over more or less wire or by cutting of wire. On the 10m dipole I cut most of the extra length. On the other bands I left most of the excess wire. I think the latter approach is the best as you can always tune down the antenna if you ever need to. 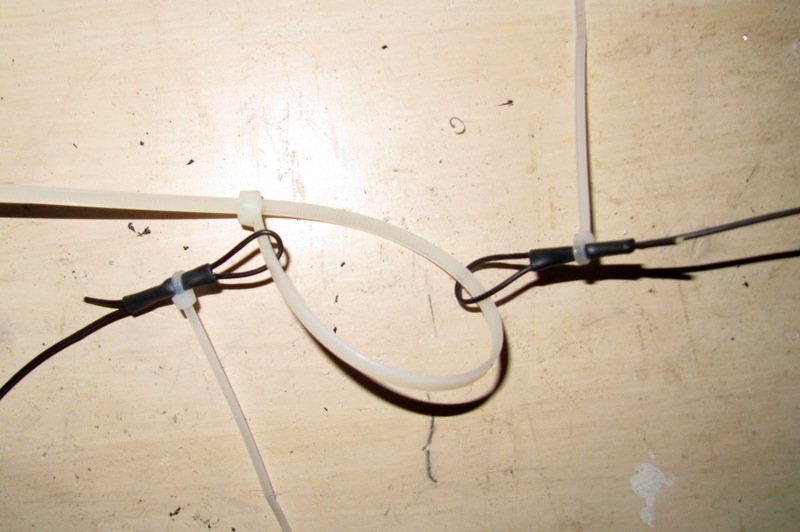 Note that I found the antenna can be tuned by only folding over more or less wire (no cutting). From 10m I went outwards to all the other dipoles. 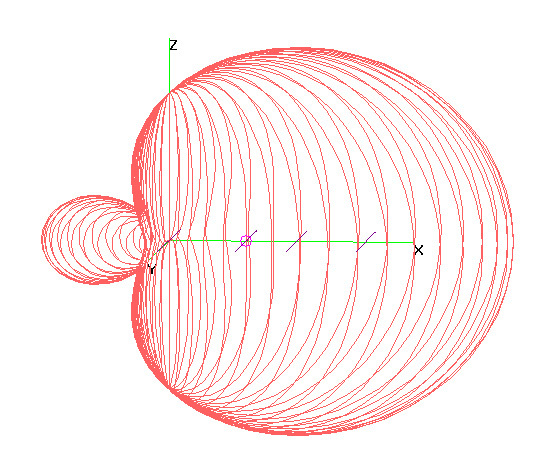 I did not find a noticeable change in the resonance of the dipoles I already tuned when tuning the other dipoles. 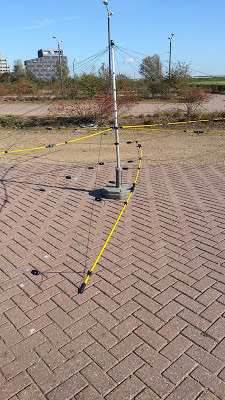 During the tuning process I tried to get some signal reports and did some comparisons to my tried and tested half wave end fed wire I set up vertically. 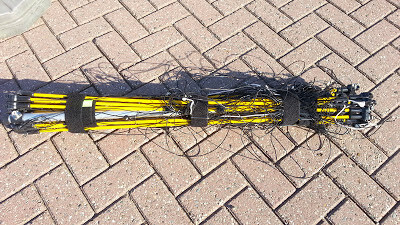 My mast was not sturdy enough to carry the Cobwebb on a height above 6m (18ft). 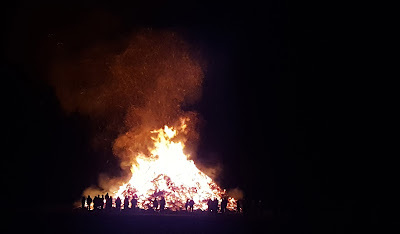 Therefore I focused on 10-12-15m to at least have some relative height. Conditions were rather poor on the higher bands with deep QSB. 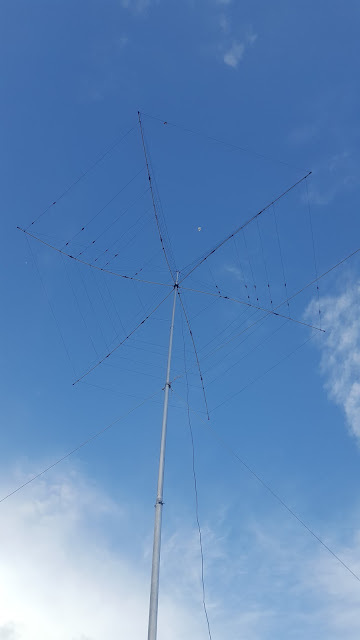 Three Italian stations came back to my calling on 15m but either the signals or their fluency in English was just not good enough - anyway there was no opportunity to get different reports on the two antennas. On 17m I heard and was able to work EY7 (5000km) using the Cobwebb. The first DX on this new antenna! 10m came slowly alive but I had to pack up soon so I just compared the signal levels on the Cobwebb and the vertical end fed wire (using a handy antenna switch). The QSB made it difficult but switching quickly back and forth I found that both antennas were most of the time very close (not even 1 S unit apart), sometimes 2-3 S units apart with no clear winner - sometimes the vertical was stronger, sometimes the Cobwebb. 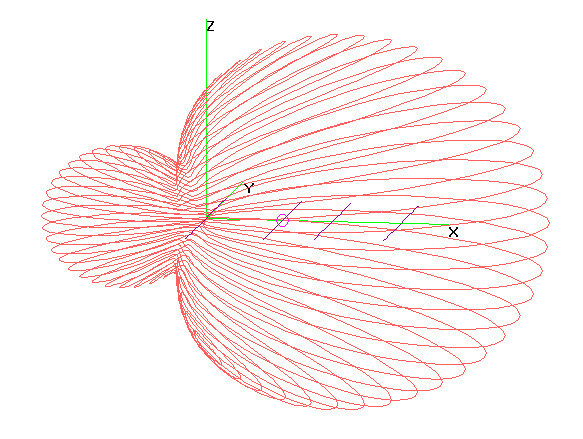 There was not enough time to find a pattern (like distance or antenna used by the other side). I will need to do more testing to establish that. 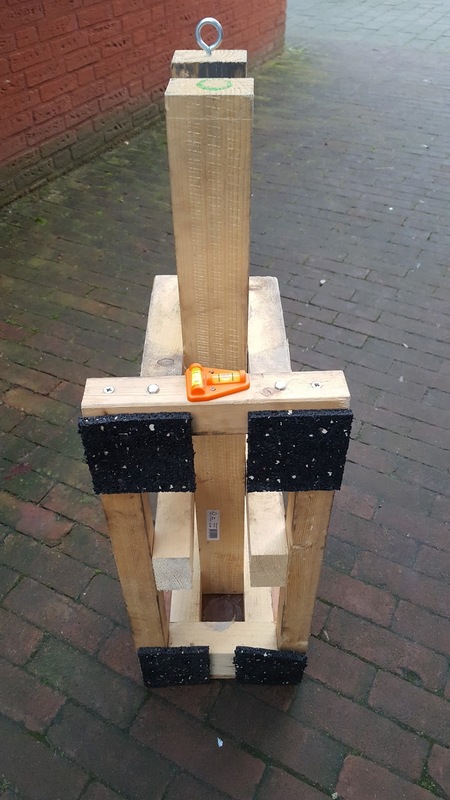 What this first test shows me is that the Cobwebb is a very practical multi-band antenna (my end fed wires need to be changed to cover the 5 bands) with a very acceptable performance. It also shows me that for a quick portable setup the end fed wires set up vertically on a fishing pole are hard to beat.